The Penn State Extension Master Watershed Stewards in Chester and Delaware counties are looking for volunteers with an interest in the environment, a willingness to learn more and most importantly, a strong desire to make a difference in the community. The Master Watershed Stewards will hold an information session on the program in Chester County on February 6 from 10:00 to 11:00 a.m. at the Government Services Center, Suite 370, 601 Westtown Road in West Chester. The Delaware County information session will be held on February 17 from 1:00 to 2:00 p.m. at the Environmental Center, Smedley Park, 20 Papermill Road in Springfield. Whether you are a teacher, an accountant, a construction worker, a homemaker, a student, or have another background, YOU can become a Master Watershed Steward. Training classes will take place on Wednesday mornings, 9:30 a.m. to Noon, and run from March 6th through May 22nd. Volunteer opportunities are available starting right away and you be able to work on meaningful projects that support our watershed association partners and community groups. Discover more about program basics, the training program, typical volunteer projects, and more at one of their info sessions! The Chester County and Delaware County Master Watershed Steward Program is a partnership between: Chester County Conservation District; Chester County Water Resources Authority; Delaware County Conservation District; Stroud Water Research Center; and local and regional watershed associations. Click Here for more information. Questions should be directed to Meagan Hopkins-Doerr by sending email to: mxh1135@psu.edu. Penn State Extension Master Watershed Steward Programs are now operating in Allegheny, Berks, Bucks, Chester, Delaware, Lackawanna, Lehigh, Luzerne, Monroe, Montgomery, Northampton, Wyoming and York counties. 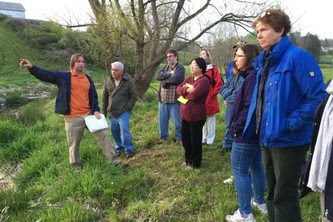 To learn more about Master Watershed Steward Programs available in your county or if you are interested in starting one, visit the Penn State Extension Master Watershed Stewards webpage. Questions can be directed to Erin Frederick at 610-391-9840 or send email to: elf145@psu.edu.